Now that really is looking back in time. David Ogilvy wrote, “I am a lousy copywriter, but I am a good editor.” If only more of us took that approach. 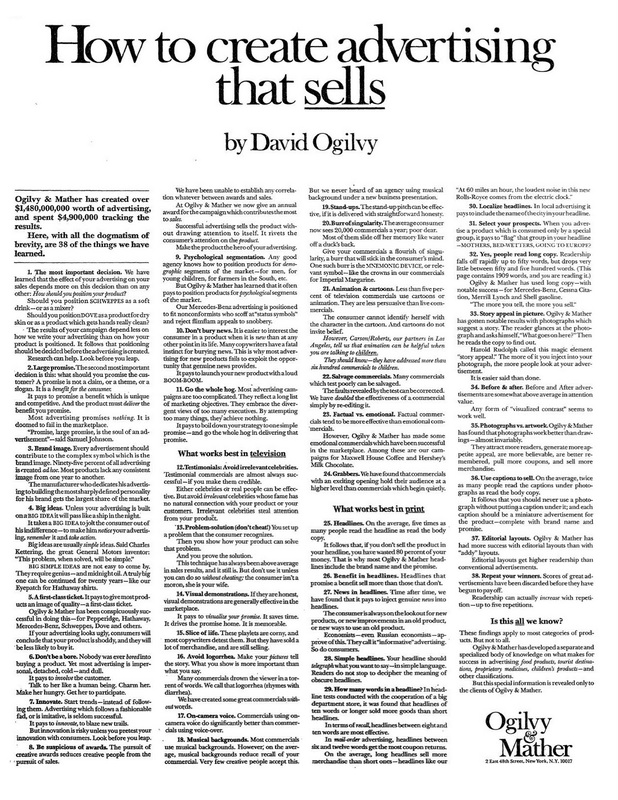 This blog post ends with the complete text of a 1,907-word 1972 ad that Ogilvy wrote for his agency. Read it, and discover how one of the great ad men of all time measured everything he could to improve results for his clients. Of course some of the findings wouldn’t hold water today — but a lot of them are still right on target. Talk about value proposition. 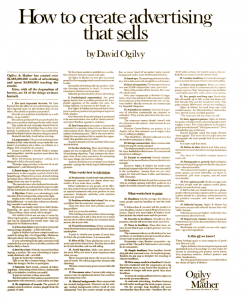 Ogilvy can still teach today’s agencies how to sell themselves. This moving letter was written in 1586 by a grieving widow. Although the translation is probably a little clunky, it’s incredibly powerful. I realize you may think this I’m being a little corny (look, I cry after a good performance on American Idol) but I think there’s a lesson here for marketers about the power of emotion and authenticity. Side note: What a website! Look at the archive page to find hundreds of letters from an amazing collection of notable writers. Including David Ogilvy. I don’t know who’s better at clarifying concepts, especially about content or inbound marketing, than Michael. I recommend this for any business owner or manager whose customers require more information than a little information before they buy, or whose competition is kicking their butts in providing that information. Here’s a case study I love because it’s about a company that created a strategic plan to beat bigger competitors; because the company (Magnolia Hi-Fi) grew into a great brand; and because it demonstrated the basics of “content marketing” long before anyone used the term. It’s a great companion piece to Michael Brenner’s post above. Diane’s post includes great lessons from a man who set big goals and put plans in place to achieve them. That he’s the definition of a gentleman, and one my first and favorite bosses, made the inclusion of this post a no-brainer. This is also an underdog story. So if you represent a small or midsize business, or if you work in a small or overlooked market, read this post and take heart. That’s this weekend’s five. Do they stir up any thoughts? Did you think the letter from the 16th-Century widow was a decent pick, or a miss? This entry was posted in Communication strategy, Creative work, The ad business by barrett. Bookmark the permalink. I thought the 16th century widow was a great pick. Very moving. It’s timeless. I hope you’re having a great weekend Barrett! Tim Bonner recently posted..Would Your Blog Win A Grand Slam? I really appreciate that Tim. It felt like an offbeat pick, but I couldn’t help myself.